Chris O’Connor is one of the founder members of Voodoo Radio. Known far and wide as ‘The Rock ‘n’ Roll Preacher’ (or when he’s a bad boy ‘Satanic Muttley’). He was also an original member of other radio stations, including ARfm, Rock247online and Nusakan, and has DJ’d for Firebrand radio too. Chris has a long background in both the rock and punk music scenes, he’s written for Hard Roxx, Powerplay, Zero-Tolerance, Burn magazines, these days he writes for Fireworks. He’s also written liner notes for several CD releases. 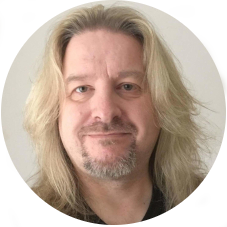 Chris has managed bands, toured managed others, and has staged managed and has been the Master of Ceremonies at various festivals (including the main stage at ‘Bloodstock’ and the ‘3 Chords’ punk festival), and has organised gigs and festivals around the midlands. You could say he lives for music. On Voodoo Radio Chris is presenting two weekly shows, the first is based around the Dark Ambient, Drone, and Grindcore genres, the other being much more around AOR/Melodic Rock, Southern Rock, and Hard Rock generally. Chris is a ‘Screwed. Blued, and Tattooed’ Pagan. He’s always said that his heart and soul belong in Cornwall. but lives in Staffordshire surrounded by rescued animals. He has a love for classic cars, photography, and is a contented country mouse.